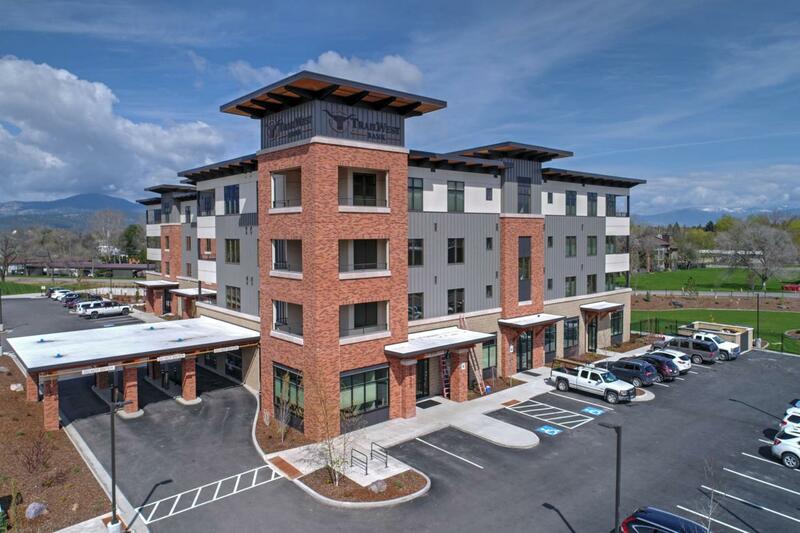 The convenience of condominium living close to multiple amenities Missoula has to offer! This is a must-see amazing, South facing condo on the second floor of the Old Fort Condominium building. Beautiful views overlooking Larchmont golf course with Lolo Peak in the background. This unique unit boasts 9 foot ceilings with 8 foot solid, fir doors throughout, featuring engineered hard wood and tile flooring. The kitchen displays cherry cabinets accented oil-rubbed bronze hardware and undercabinet lighting, granite counter tops and GE appliances. Easy access laundry room right off the kitchen with stacked washer and dryer. Main living areas feature large, Pella windows that let in plenty of natural light & backlit crown molding for a soft light in the evening hours.There is a sliding glass door leading out to a covered patio, perfect for enjoying the outdoors. The master suite includes a walk in tile shower with glass door and heated tile flooring. The HOA includes water, sewer and over 1 acre of maintained landscaping with secure perimeter fenced courtyard, blazing fast, high-speed internet, snow removal, and garbage pickup. This ultra secure building has coded entry on main floor and the elevator is coded as well. The fenced common area is enhanced by a gas fireplace surrounded by open patio that includes amazing furnishings for your enjoyment. Underground parking garage with designated parking space and secure storage room for your belongings. To see this property please call Kory Mytty @ 544-8071 or your real estate professional.